In a hydraulic system,an unusual vibration is observed. The maximum amplitude of the vibration is observed in the pipeline. There is only one Electro-Pump in this system and in this building. May be due to periodic pressure release through some valve that could be broken or not working properly (cocked valve). It is hard to tell without knowing exactly how the system works. The issue could also appear due to some machine's operating cycle property, for example when hydraulic press gets in contact with the workpiece and the pipes aren't properly attached, they could resonate at some higher pressure. We checked the valves, But we will check again anyway. All machines is on standby. there is not any machines on operating cycle. Are you sure that the waveform is not time-scale in milliseconds? 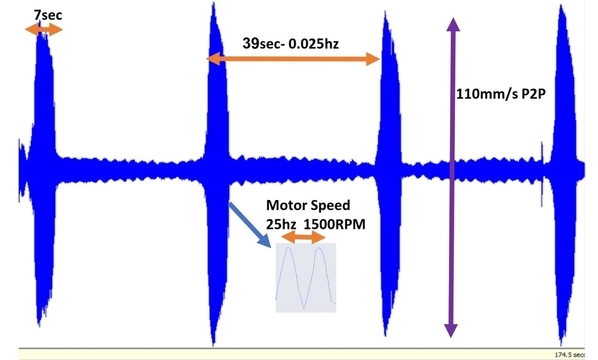 If it is then, 39 m-sec = 25.6 Hertz or equal to 1xSS of pump. Otherwise there is possibly a Water Hammer acoustic pulsation, but a repetitive pulse at 39 seconds interval would be highly unusual. How about a pressure or volume unloader valve internal or near pump? If machines are on standby and pump is on, then there should be an open recirculation path. Water Hammer acoustic pulsation is completely periodical? What we can do? what is Additional test for it? I will check other parameters. Vibration changes are with 0.85 bar Pressure changes. How leaking or issue on valves, increases the vibration to 10 times? 100 mm/s is nothing unusual for some piping issues in industry. Vibrations at this level cause some damage soon or later. In most cases the reason is some source frequency resonating with some part's natural frequency. In your case there should be some recirculation bypass (as Walt said) otherwise your system would explode. The recirculation system should have some automatic pressure regulation valve. It should constantly (every moment) allow the oil to go through when the pressure exceeds the value set. But when the valve is cocked or broken, in one moment the valve can't allow the oil to go through until the pressure reaches some higher level. Then the valve is suddenly released and this shock pulse could trigger some piping resonance. That's only my guess, one of the probabilities. You didn't send much data, my friend. Which machines are on the hydraulic system? Why machines are all on standby and although you are running the hyd. pump? Is the issue still present when you turn on the machines? What type of pipes? How are they installed? Any photos? As others stated vibration data is needed to assist in troubleshooting. My take on your post shows a time waveform with unknown resolution. The rise in amplitude appears to be sudden, like a valve let pressure slip by and the pump started working to maintain system pressure for 7 seconds, then as the pressure bleeds off this happens again. You have to understand the system operation before you can say this is even an issue. Are you taking data on a pipe or the pump? piston/rotating vane pump? What is the main issue you are having? I agree with Dave and others. What is the dominant frequency during a single high vibration event? Is it pump pulsation frequency (or harmonic) or a natural frequency of the pipe? Water Hammer is not a periodic event, but each pulsation event may be amplified by fluid resonance and/or by structural resonance. This system is used to move a cylinder, In Our hydraulic system, we have one machine but Even when the machine is off, there is vibration. Our main issue is "abnormal Noise and sound"
By the "BUMP TEST", I will calculate the "Natural frequency". You can see the movie about the issue in the attachment. It has been proved to us that this is not the case when oil is cold,For this reason, the amount of vibration in this movie is not high. But you can see vibration changes between seconds 16 to 23. I advised to increase the number of clamps to increase the stiffness of the system(K), so that Resonance does not occur. Because, as you can see in the picture, the connection is loose at the exact points. Thanks again to the attention of all my friends. If there was an opportunity in the future, I will attach the Time signal after fixing the piping. If you have a different opinion, I'm hearing. How is that your modulation interval in the movie is very short (around 2 seconds) compared to 39 seconds in your initial twf pictures? Is that also connected with oil temperature or am I missing something? There is exactly another modulation in the signal. there is one another modulation interval around 3 sec. Can this beat be due to the difference between the natural frequency and the motor speed? 20 RPM of difference can make this beat. Your shorter time modulation picture is more common for two machines that operate at the same speed or when the machine load is changing over time. This one's amplitudes and prominence aren't so critical so I wouldn't pay much attention. The only remaining factor to create the beat is The difference between the Motor speed and the natural frequency.